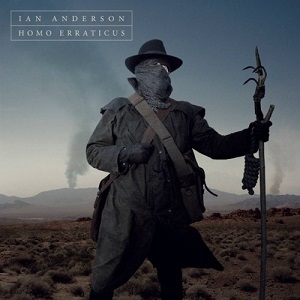 Festivalphoto spoke to Ian Anderson to talk to him about his new album, Homo Erraticus. Festivalphoto: Your new solo album "Homo Erraticus" is out next week. Since the musicians on it are all Jethro Tull members, how is an Ian Anderson solo release different from a Jethro Tull album ? Ian Anderson: Well Jethro Tull is for me three things. It's the huge body of repertoire of songs I've written since 1968 and produced and engineered and performed on, so it's indelibly me but it's under the name Jethro Tull, which brings us on to the second definition which is a collective name for 28 musicians who over the years have been part of the band Jethro Tull. It's not like Led Zeppelin where there were only four guys, or The Who where there were only four guys, the Rolling Stones where there were six guys, or even Deep Purple where I suppose collectively you could say there were six or seven, maybe eight guys who made up Deep Purple over the years, with Jethro Tull there have been 28 over the years, so that's the other definition, that huge musical family of friends and musical associates over 45 years. The third definition, which I suppose I've been burying for much of my life out of embarrassment, is that it's the name of an 18th century agriculturalist who invented the seed drill, and is no stony cold dead, and I am guilty of identity theft. I've been making a ton of money using this guys name over the last 45 years, and I don't feel good about it now any more than I did two weeks after we got the name Jethro Tull, when I realised our agent had named us after a dead guy. So that's the third thing, and I suppose as I come to the end of my performing life, I'd rather be me and not and not go out unnecessarily trading on the name Jethro Tull. Most of the journalists I speak to say that as soon as we put it on, right from the opening piece of music then you know you're listening to Jethro Tull, then they correct themselves when they remember it's actually billed as an Ian Anderson album. Festivalphoto: You've said previously that you started writing the album on the first January 2013 with a blank sheet of paper. Ian Anderson: Well an empty head is really the important thing. Anybody can have a blank sheet of paper, but it was important that I didn't have any series of backup half completed ideas from some previous album or that was just stored away, like a squirrel burying some musical nuts to be dug up in spring when it gets hungry. I really had to have an empty head, and that was important self discipline. To have a real real blank canvas to work on and see what happens, and hopefully within an hour or so you've got something going. Then you get something else going and by the end of the first day you've got a chunk of music which certainly far from complete but is the essence of what is going to be the opening piece of music. Then you think "well what comes next", and what came next was to try and write some bullet points to myself about where I would go with this and what I would try and develop it into, and in fact what I wrote down on that second day is very much what is actually on the album artwork, it's hardly edited at all from what I wrote down back then as a series of scenarios that I could go on to write about. So it's a very natural organic kind of process, but as you can imagine a pretty intense one, mentally, intellectually and of course musically, because it's a lot of stuff to get through in a three week writing programme. I only had a certain window of opportunity, which is I suppose a good thing, to be driven by a deadline. Journalists are used to deadlines, people who work in television, they're used to that, people who make movies, they're used to that, and rock stars shouldnt just be sitting on their fat arses in some cottage in the Welsh hills waiting for the muse to strike because somebody is waiting for it. Ian Anderson: Well I think you've got to trust your own growing experience, and hopefully growing ability in that regard, and mustn't be afraid of falling short. You've got to be confident that you'll do just as well as you possibly could but putting a finite time limit on it. I know from experience that you've got to ramp up the pressure on yourself and then you do something better not worse, you raise your game and increase the intensity of what you're doing. If you're qualifying for a formula one race it's not a couple of laps in the sun for fun, it's probably the most scary thing you're going to do that day because you are really going to push it to the limits whereas in the actual race you're maybe going to hold back just a little because you've got to get to the end of the race. I see it in that same way, where there's this period of preparation where you absolutely have to push yourself to the limit in the writing and arranging of the material. If you don't get that bit right then you're not going to do so well when it comes to recording it and ultimately going out to play it on stage. So it took three weeks to write it. How long did it take to record it? Ian Anderson: Well there was a long gap in between. I wrote it in January, but then I made some demos of it in March which was an opportunity I had when I was on holiday for seven days, to make some demos to send to the other guys in the band, which I did, and then six or seven months went by before I think any of them looked at what I'd sent them in terms of chord sheets and lyrics and audio demos because we were all on tour all the time, and they like me they have the confidence to know they can leave it till a couple of weeks before they really really do need to go and try to play it for the first time. They can get their heads around it and make up their own parts, their written out scores for them to play. So we started work at the end of November - we ended the tour in Prague I think, then a week later started rehearsals - about 8 or 9 days of rehearsal then we did about 8 or 9 days of recording before Christmas and then after the Christmas break of ten days or whatever it was, we went back to work on the 2nd January and did another ten days of recording and final tweaking. Then it was around six or seven days to mix in stereo and 5.1 then around three weeks of time spent working on the artwork and stuff. It's pretty much the same plan as even going back to "Thick as a brick" in 1972, it was the same ten days rehearsal, maybe two weeks of recording, five days of overdubs, five days mixing, that sort of thing. It's as fast as you can go really. If you can nail in terms of prime recording, short of inevitably doing vocals because you have to do those in isolation from an acoustic and audio point of view, and the same with acoustic instruments like the flute or acoustic guitar - you can't stand there in the midst of drum kits and noisy instruments playing live at the same time. We do that in rehearsal, we play it live like we would on stage while we're learning the music and rehearsing it, but during the actual recording sessions I was in the control room and the guys were out there in the studio. We have the same sort of pattern really, if you can nail four or five minutes of real time recording in a day and then you allot maybe half a day to flute and stuff, and then half a day for mixing, you can figure if you've got 15 tracks on an album you've got 30 days of work. That's pushing it. Many people wouldn't achieve that either because they haven't got the discipline, or they just noodle away at it over an extended period of time, but we were always driven by having to finish this album to absolutely deliver it on 16th January 2014. It had to be handed over to Jacko for mixing, and it had to be handed over on the 22nd for mastering. It was all driven because we had a release date set since way back in October. We had a fixed release date because we had tours booked and in place, so you're driven absolutely by decisions you've had to make six or eight months before. Festivalphoto: You've got a UK tour planned to run from 28th April till 25th May covering most of England and Scotland, but no Welsh dates. Ian Anderson: That's true. There are lots of places we don't get to visit based on availablity of venues and geographical routing. Then we go to Europe and play a bunch of rather disconnected, isolated summer festivals and shows which are not the full production tour, it's just "best of" kindof material. Then in September/October we head out for two US tours followed by I believe Australia and New Zealand if they send the signed contracts back soon, and then in 2015 we go on to do our second wave of European shows and Latin America. Then I shall die, probably. or go fishing, I'm not sure which. Not that I do go fishing. I could have said play golf, but I don't play golf either, so it's more music or death - simple options. Festivalphoto: On the tour you're playing the whole of the new album then a selection of jethro Tull classics. How hard is it to pick songs that you enjoy playing and which also keeps most of the audience happy? Ian Anderson: Yes that's right, and it's always a question, What is the best of Jethro Tull? I could look back and pick loads of stuff I really want to play but it could end up being three songs in the same tempo or key or same time signature, and you've got to try and mix things up based on variety, a sense of dynamic and drama, and you've got to make sure you cover the prime years of creative Jethro Tull music. You've got to try and cover the genres too because some things are more folk rock, some are a bit more blues based, some are more classically oriented, and by the time you've figured it all out you've come down to maybe a hundred songs that will illustrate those things, and you've got to pick 12 of them or whatever it is that take up the second half of the show. Rather than it just be the same heavy hitter mainstream Jethro Tull tracks that people hear, and want to hear again because they're standards, it would be like if Deep Purple went on stage and didn't play "Smoke on the water" or Procul Harem didn't play "A White shade of pale", it's unthinkable that the Rolling Stones wouldn't play "Satisfaction", people are going to tear their hair out, scream or at the very least ask for their money back. So you have to make sure that some of that stuff is there, and then you try and pull out some wierd things out of the woodwork, maybe that you haven't played live before or haven't played for 40 years and luckily I have a couple of those things that were quite popular tracks, two of them were in the singles charts, and in the case of one of them I'm fairly sure we haven't played since the early seventies. I found I had an intense dislike for the song, well not the song but a little bit of the lyrics and a person who wrongly believed I'd written the song about them and that just put me off playing the song ever again, until out of some perverted sense of musical justice maybe I should give it a go and learn to like it. Surprisingly we've now been rehearsing for four days and I like this one. There's a couple of bit's I don;t like about it, I find it hard to get the words out of my mouth but that's ok, I just give them to my buddy Ryan to sing. He gets to sing the lines that I hate while I get to sing the bits I don''t mind plus the choruses and flute parts and I'm fine, so I've grown to like this - so far. We still have another few rehearsal days and it could eat the dust any time, but at the moment it's still in the set. That's the tightrope you walk, trying to make it different each tour but not so different that people feel alienated or they don't get their cosy comfort blanket to hold onto as they drift off into the twilight hours of thei lives. We have a pretty old demographic in the UK. It's a bit like Cliff, who is caught in this sort of spiral, I wouldn't call it a spiral of despair but he's not a happy bunny. I've talked to him briefly about it and it's difficult for him because he never made it in America and he's sort of embittered that he's got this loyal fanbase in the UK, Australia, New Zealand and maybe a very little bit in Germany. I remember haivng dinner with Cliff in Germany when we were doing a big TV show there so he's obviously known there but probably only for one song which is "Devil Woman", which isn't one of Cliff's favourites because he found out that it was not very Christian but he didn't write it, so he obviously didn't pay enough attention to the lyrics. The reality is that when you've got a declining group of fans, who either don't get out of the house very much or they don't get out of the ground much because they're dead and gone, then it is an audience that is disappearing, and it's the same for us. We don't have a high replacement factor in the UK - we really don't see many young people in the audience. In Europe as a whole, take Italy for example, it'll be summer shows and most of the people that I will see in the front will be fairly young, because if it's a standing show outdoors in the summer then the people at the front are the young ones - the old guys are at the back near the portaloos and the beer tent. So we do see a lot of young faces when we play in Latin America and certain parts of Europe, Germany I'd say is quite an older audience but like America you do see a good sprinkling of younger people too. In the UK though if you come to a Jethro Tull concert it's like standing at the checkout counter in Waitrose, people are cheerful, they'll talk to you even if you are the prime minister, but seriously they are getting on a bit, and tend to be doddery and in the way, bless them. I'm saying this of course with tongue in cheek, but a lot of them are close to being my age and a lot of the time inevitably it is a bit of an effort to go to a concert in an overcrowded city centre, deal with car parking, it's more of a hassle than when you're in your 20s or 30s. You have to keep in mind a bit of sympathy for people rather like me who prefer to listen to their records at home or switch on the Television. I don't go to concerts for precisely those reasons, I cannot be bothered with all the hassle factor of going to a major city to see a concert, I just don't do it - even when I know I'm going to get a free ticket I still don't do it. Festivalphoto: Thank you very much for your time.